"Mention Easter Island to just about anyone and 'mystery' immediately comes to mind," begins The Statues That Walked: Unraveling the Mystery of Easter Island (Free Press, 2011) by Terry Hunt, who joined the University of Oregon as dean of the Clark Honors College this year, and coauthor Carl Lipo. In the excerpt below, the authors' anthropological investigation offers new insight into how a South Pacific island known to have once harbored verdant forests became the bleak landscape we associate with the remote island we now call Rapa Nui. Seeing Rapa Nui today, it is so barren and exposed it is hard to imagine that the island was once covered with a dense palm forest. Reconstructing the nature of the island's forest and explaining the timing and causes of its dramatic loss would be critical to understanding the whole story of the island, and we set out to determine exactly how the deforestation figured in the island's alleged collapse. A variety of research now shows that when Polynesians first set foot on Rapa Nui it was indeed covered in a forest of literally millions of giant palms. Similar to their cousins that survive on the Chilean mainland, these stately trees towered to heights well over 100 feet, making them among the largest palm trees in the world. They grew slowly, perhaps taking as much as a century to reach maturity and bear fruit, and then living for hundreds more years. . . . Eventually Easter's growing population was cutting the forest more rapidly than the forest was regenerating. The people used land for gardens and wood for fuel, canoes, and houses—and of course, for lugging statues. As forest disappeared, the islanders ran out of timber and rope to transport and erect their statues. Life became more uncomfortable—springs and streams dried up, and wood was no longer available for fires. . . . The person who felled the last tree could see that it was the last tree. But he (or she) still felled it. This is what is so worrying. Humankind's covetousness is boundless. Its selfishness appears to be genetically inborn. Selfishness leads to survival. Altruism leads to death. The selfish gene wins. But in a limited ecosystem, selfishness leads to increasing population imbalance, population crash, and ultimately extinction. We had grown skeptical of this interpretation. So we decided to take a close look at all of the evidence about what might have happened to the island's magisterial palms. [Archaeologist Steve] Athens's work, combined with . . . other evidence, suggested a compelling new explanation of what happened to the forests of Rapa Nui. After the Polynesian colonists arrived on the island, in about AD 1200, the rats they had brought with them gorged themselves on the unlimited food supply. Millions of giant palm trees offered a virtually endless buffet of nuts. Laboratory studies of rat reproductive potential under such ideal conditions document that populations can double every 47 days. Starting with only a single mating pair, the rats could have attained numbers into the millions in just two years or so. Eventually the rat population would have gone into decline, adjusting their numbers to the amount of available food. The ecological case for this scenario is so strong that one has to ask how the rats could nothave brought dramatic devastation on the Jubaea palms, and other native plants, as well as preying of course on nesting seabirds, land birds, and their eggs and chicks, in addition to snails and many insects, dramatically and rapidly transforming Rapa Nui's ecology. We were to learn, in fact, that the idea that rats played a major role in Rapa Nui's deforestation was not entirely new. Anthropologist Grant McCall told us that in 1968 he recalls the resident Catholic priest and researcher on Rapa Nui, Sebastian Englert, telling him about "little coconut seeds" (Jubaea palm nut shells) he had found in "rat caves." That may have been the first inkling of the role the rats had played. Botanist John Dransfield, who joined John Flenley in early pollen studies on Rapa Nui, also noted the discovery of nuts of the extinct palm in caves, which had been gnawed by rodents, and they argued that this "could have helped to make the species extinct." And John Flenley and his associates had also hypothesized that "the effects of introduced rodents on the biota of oceanic islands are known frequently to have been disastrous . . . and it seems that Easter Island may have been no exception. Whether the extinction of the palm owes more to the prevention of regeneration by rodents, or to the eating of the fruits by man, or to the felling of the mature trees, remains an open question." That question had simply not been followed up on. . . .
Of course many islands have native forest that has persisted despite invasion by the Polynesian rat. But as biologists tell us, each island is unique in its history, biodiversity, and biogeography. To argue a false and simple cause-effect that "rats mean deforestation" would assume that diverse islands share the same history and ecology. Jared Diamond said it well: "Rats have caused catastrophic extinction waves on some islands, a few extinctions on others, and no visible effect on still others." Having learned about all of these findings, we set out to determine what the evidence would tell us more specifically about rat devastation on Rapa Nui. We weren't going to assume that rats accounted entirely for Rapa Nui's deforestation, even though left alone they probably could have. The remaining question was what were the relative impacts of rats, fires, and the felling of trees by the colonizers on Rapa Nui's deforestation. We know from early historic visitors that the deforestation was complete or nearly so by about AD 1722. A dense forest of palm trees and more than 20 other woody tree and shrub species had mostly disappeared. At least six land birds, several seabirds, and an unknown number of other native species were lost to extinction. Many of these losses occurred before Europeans reached the island. Other extinctions probably came after livestock were introduced to the island by Europeans, causing environmental abuse. By the late 19th century thousands of introduced sheep, cattle, and horses were grazing freely over the island and would surely have delivered a final blow to native plants or animals that may have survived. 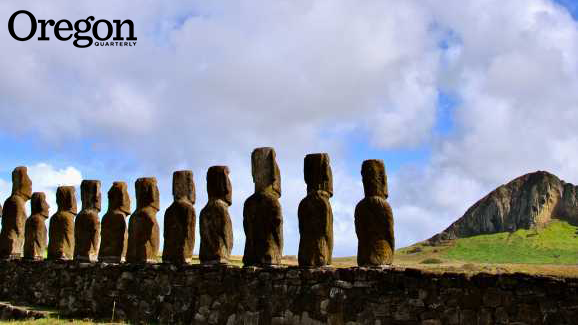 For Rapa Nui we have seen that deforestation began shortly after Polynesian arrival, but loss of the native forest took 400 years, perhaps longer, with remnants of the vegetation lasting long enough to be witnessed by Europeans. Over this same period, Polynesian numbers increased to a maximum population of 3,000 or so by about AD 1350, even as the forest decreased. While colonists on Rapa Nui would face other problems, deforestation did not, therefore, spell disaster. Nor was the story one of people recklessly cutting down the island's last tree. The best evidence suggested to us that one of the primary rationales for the ecocide scenario of the fate of the island was badly flawed. A great deal about the nature of the native culture had been inferred from the notion that the islanders had been reckless in their management of the forest. If they had, in fact, had so little to do with its depletion, we believed it was now imperative to fundamentally rethink the story of what sort of environmental stewards they were. We also wondered how much of the rest of the story might turn out to be different. Reprinted by permission of Free Press, a division of Simon & Schuster, Inc.